At Loggly, we’re really excited to be participating in the AWS CloudTrail launch and more importantly, making our support for AWS CloudTrail available to our base of more than 3,500 log management customers. Because Loggly’s customers tend to be cloud-centric organizations, a huge percentage of them run all or part of their applications on AWS. And they are always looking for new ways to operate smarter and sharpen their competitive edges. Support for CloudTrail is coming soon! Until now, there hasn’t been a good way to get a record of AWS API calls made on your account. AWS CloudTrail fills an important information need for our customers; and Loggly makes that information much more consumable for solving real operational problems. For a given resource, which AWS user has taken actions on it over a given time period? What is the source IP address of a given activity? When was a particular Elastic IP (dis)associated with a network interface? With Loggly’s event parsing capabilities, it’s easy to see all of the structured fields that are in the AWS CloudTrail data. Then, you can immediately drill down on a user, source IP address, or other facet and narrow down or rule out potential causes of a particular issue. In addition, customers of our Standard and Pro plans can set up alerts that inform their security teams when a user performs too many actions or let them know if activity has spiked on a particular source IP. Loggly’s customizable dashboards can show exactly who is creating and terminating AWS instances. These dashboards include great point-and-click charting capabilities, which really help users make intuitive sense of the data — and give more compelling presentations to their bosses. 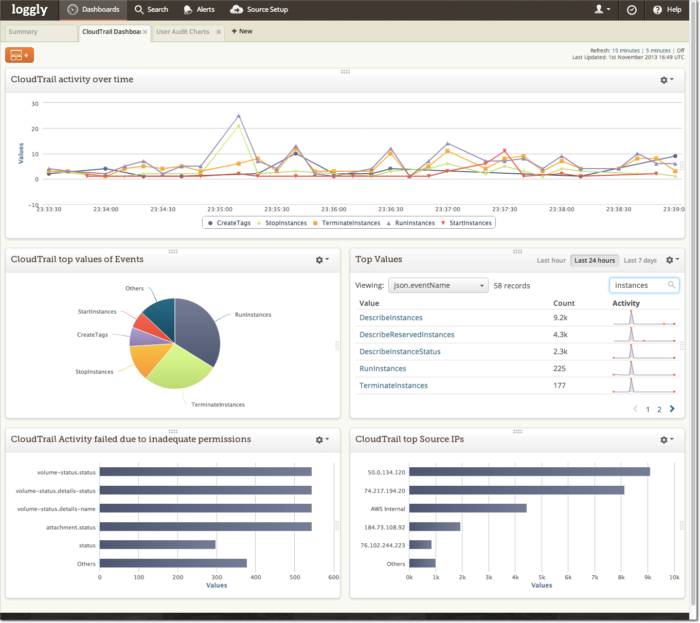 The best news of all is that setting up AWS CloudTrail logging is incredibly easy and available to all our customers. Just supply the appropriate S3 bucket name, and the data will be pulled by Loggly in real-time. Not currently a Loggly customer? Sign up today and get instant access to AWS CloudTrail in Loggly. Loggly has grown to more than 3,500 customers by offering a cloud-based log management service that’s simple to set up and simple to use for operational troubleshooting. Given the huge role that AWS plays in our customer base, adding support for AWS CloudTrail was a simple decision to make. I have signed up with Loggly but still don’t see the CloudTrail option enabled under Accounts. When will this be made available?